The VoSI Focus List is a compilation and reference list of stocks for which Pocket Pivot or Buyable Gap-Up Reports have been issued. It is not intended as a "buy list" or a list of immediately actionable recommendacise discretion and proper judgement in determining when and where stocks on the Focus List can be purchased. The following notes are intended to assist in this process. Please note that members can enlarge the Focus List image by clicking on the body of the email and then holding the Control Key while pressing the "+" key until it is large enough to read. The S&P 500 and NASDAQ Composite Indexes, along with a whole host of other major market indexes, have now broken below their respective 50-day moving averages. Meanwhile a number of leading stocks have started to show signs of weakening, but it remains a matter of simply sticking to your trailing and absolute stops on any remaining long positions. The Market Direction Model (MDM) remains on a buy signal. The VIX Volatility Model (VVM) is currently on a cash signal. MKS Instruments (MKSI) violated its 50-day moving average on Thursday as selling volume has picked up substantially within the pattern. Netflix (NFLX) Monday after the close. Amazon.com (AMZN) is pulling into its 20-dema on increased selling volume after failing to hold the $900 Century Mark. If this cannot hold near-term support at the 20-dema, a test of the prior breakout point down at 860.96 is possible. 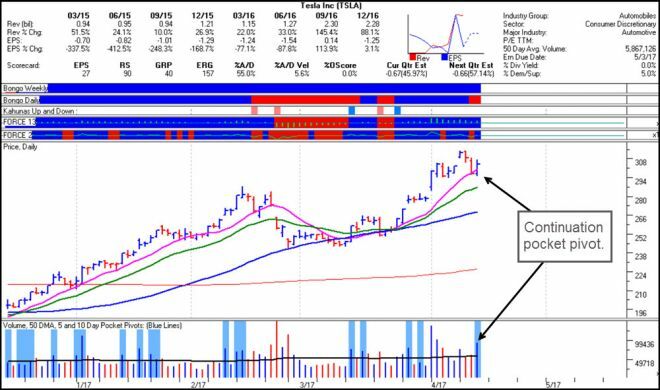 Baozun (BZUN) had a strong move after we first identified it as a "VooDoo" buy set-up on March 31st. That move represented a breakout from a low-base price range, moving higher by just over 17% in three days where at least partial profits should have been taken. Unsurprisingly, the breakout has since failed as that tends to be more the norm these days, and the stock is right back at its 50-dma. While this puts the stock in a possible lower-risk entry position, it must absolutely hold support around the 50-dma to remain viable. Coherent (COHR) has violated its 20-dema but is still finding support at its 50-dma. One notable, objective feature of COHR's current chart pattern is that it is has been setting up as a late-stage failed-base (LSFB short-sale set-up since failing on a breakout attempt back on March 28th). Chemours Company (CC) has violated its 20-dema and is similar to COHR in that it too is starting to show early signs of a possible late-stage failed-base type of situation as it pulls right back to its March 28th base breakout point. A breach of the 50-dma would cause us to remove the stock from the Focus List. Facebook (FB) has closed below its 20-dema for three days in a row. Previously it had not closed below its 20-dma since the first trading day of January. Snap (SNAP) has undercut the prior week's low at 20.03, closing Friday at 20.19. 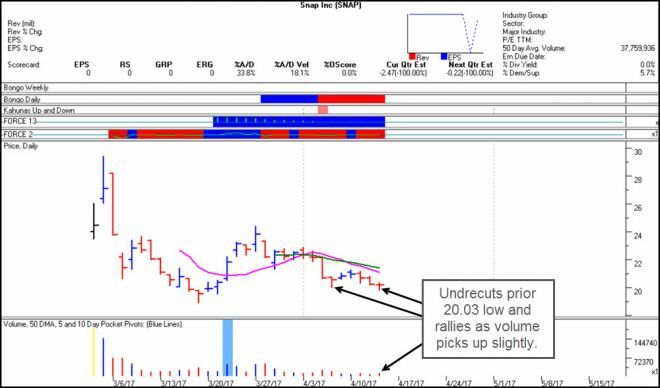 This would trigger an undercut & rally (U&R) buy signal, using the 20.03 price level as a tight selling guide. Should this U&R set-up fail, then the next reference low for such a set-up would be the 18.90 absolute low in the current base. Square (SQ) posted a pocket pivot on Wednesday but gave up all the gains associated with those gains on Thursday. 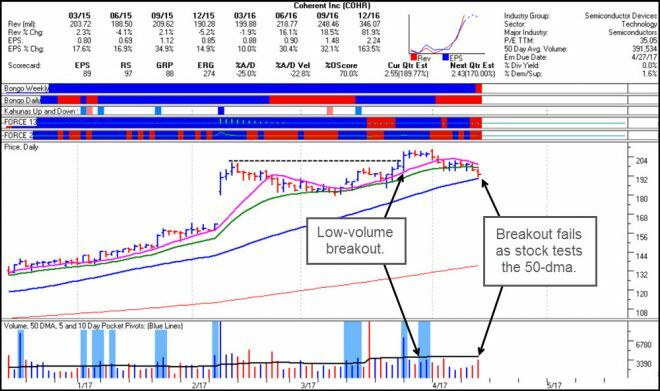 Wednesday's pocket pivot was attributable to buy out rumors, and once nothing concrete was forthcoming following the rumors, the stock simply drifted back into its current base. Tesla (TSLA) posted a continuation pocket pivot at its 10-day moving average on Thursday as volume came in well above-average. The move was attributable to news from the company regarding future product roll-outs of an electric semi-truck and an electric pick-up truck. Charts shown are courtesy of HGS Investor Software, LLC (highgrowthstock.com), (C)2017, used by permission.